Applied Urban Ecology: A Global Framework explores ways in which the environmental quality of urban areas can be improved starting with existing environmental conditions and their dynamics. 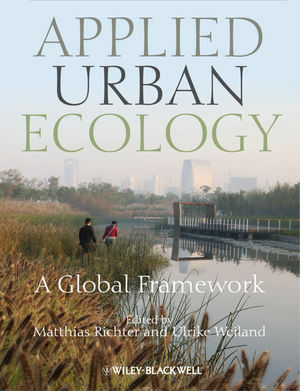 Written by an internationally renowned selection of scientists and practitioners, the book covers a broad range of established and novel approaches to applied urban ecology. Approaches chosen for the book are placed in the context of issues such as climate change, green- and open-space development, flood-risk assessment, threats to urban biodiversity, and increasing environmental pollution (especially in the “megacities” of newly industrialized countries). All topics covered were chosen because they are socially and socio-politically relevant today. Further topics covered include sustainable energy and budget management, urban water resource management, urban land management, and urban landscape planning and design. Throughout the book, concepts and methods are illustrated using case studies from around the world. A closing synopsis draws conclusions on how the findings of urban ecological research can be used in strategic urban management in the future. Applied Urban Ecology: A Global Framework is an advanced textbook for students, researchers and experienced practitioners in urban ecology and urban environmental research, planning, and practice. Matthias Richter, Environmental Scientist, Publicist and University Lecturer, Germany. Ulrike Weiland is Professor of Urban Ecology at the Institute for Geography, University of Leipzig, Germany. A. PATHWAYS OF THE ECOSYSTEM APPROACH. C. FLOODING AND CLIMATE ADAPTATION.